Lots of people swap outdoor runs with the treadmill when the snow flies. When the temperatures are below freezing, you can dress in layers and still get out and enjoy the winter scenery with a run. 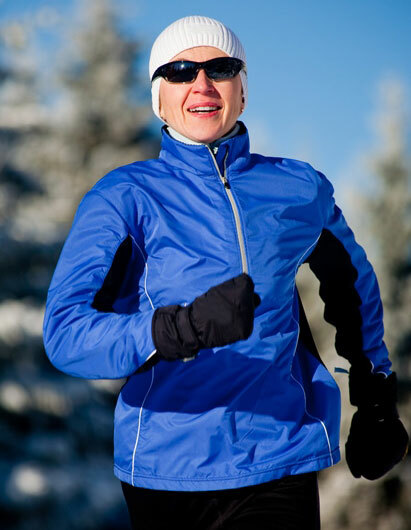 According to Active.com, dressing for 15 to 20 degrees warmer than it actually is can be a good rule a thumb for winter running. If you plan to brave the blizzard-prone Minnesota winter weather for a run, here is a quick guide to the gear you’ll need to keep you going. Worn closest to your body, a base layer should include fitted clothes that wick moisture away from your skin. Seek out synthetic fabrics like nylon, polyester, polypropylene, and spandex; or natural wool for base layer pieces like sports bras, long-sleeve T-shirts, socks, gloves, and hats. Avoid wearing cotton clothing in your base layer—cotton will trap your sweat and you’ll feel wet. Over your base layer, you’ll want to focus on lightweight pieces that keep you warm. Stock up on thermal tights, insulated vests, fleece hoodies, and neck warmers (also called neck gaiters). It won’t hurt if your mid-layer pieces are moisture wicking, too. On the really nasty weather days, you’ll want to add an outer layer to protect against wind and snow. Look for jackets, pants, and gloves that are wind- and water-resistant. Outer layer pieces should fit comfortably over the other layers and should let you use your full range of motion. Equally important to staying warm and dry is avoiding injury from slips and falls on snowy sidewalks. Consider running in trail shoes, which tend to have a bit more traction. Or, if you’ll be running on packed snow or ice, stock up with a traction device like Yak Trax or Icespike. When you’re ready to run, use the Runner’s World What to Wear tool to confirm you’re geared up for a great run in any weather.